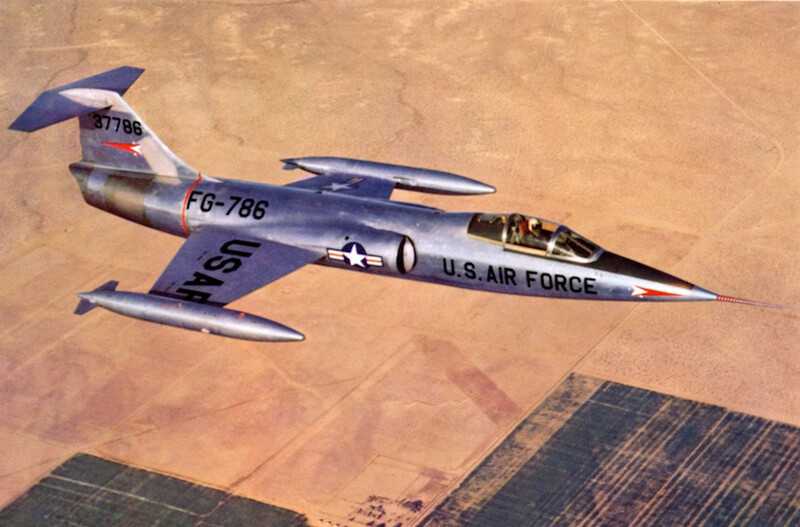 The F-104 Starfighter was launched in 1954, nine years after WWII. It had short stubby wings and a T-tail. According to wiki, the short stubby wings caused inertia coupling and the T-tail reduced this. 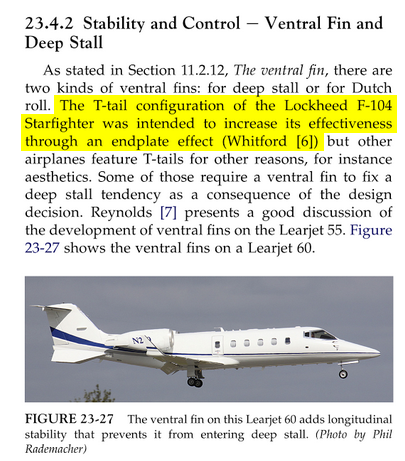 My question is: is that really the reason why the F-104 had a T-tail? How does that help reduce inertia coupling? @aeroalias answer has many of the reasons for the T-tail. Had edited the question with some additional info, it was suggested to put this in an answer instead. The high tail position was selected ... after extensive wind tunnel tests (which) proved that the location was necessary to obtain optimum stability and control about the pitch axis throughout the wide Mach range. The position also results in minimum transonic trim changes while accelerating to supersonic. Another advantage was that the high tail on the swept vertical fin reduced interference drag. While the problem was inertial coupling was quite well known during 1950's, the design of the F-104 was frozen during the same period, so it is difficult to tell conclusively if that is the reason for F-104 having a T-tail. The sideslip build-up is controlled by the induced rolling moment. As sideslip builds up, the centrifugal or rolling forces increase and this tends to displace the aircraft fuselage perpendicular to the flight path. ... the high tail position of the horizontal stabilizer raised the center of pressure. ... whenever we sideslip an aircraft, a rolling moment is induced that resists the sideslip. This induced rolling moment is generally termed dihedral effect. 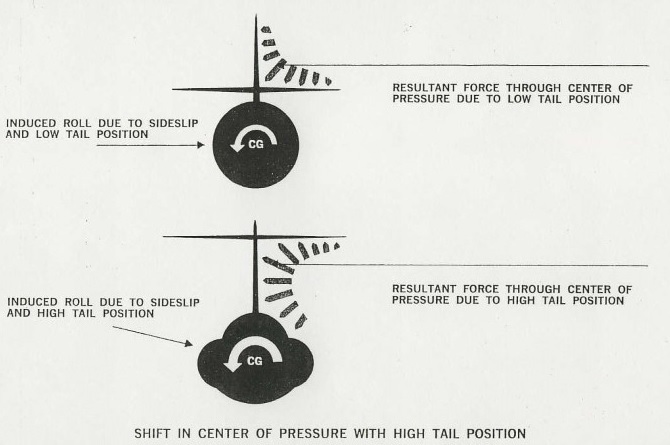 ... with any sideslip, the restoring force acting through the center of pressure does not act through the c.g of the aircraft. Therefore, a sideslip condition actuates the restoring force on the tail but at the same time, induces a roll. ... now that we have raised the tail and consequently the center of pressure and the positive dihedral effect has been increased considerably. The T-tail reduced inertial coupling by preventing sideslip buildup. The Wikipedia article lacks a reference. It seems it's to keep the fin short while being effective, which reduces weight and drag. A classic use of T-tails. The cited Whitford I believe refers to this book. what measures were taken to prevent inertial coupling from happening. According to the document, the T-tail provided better stability, control, and trim characteristics throughout the speed range. It also provided the same aerodynamic coupling effect as wing dihedral does, that's why the wings have anhedral. Inertial coupling is not an aerodynamic phenomenon. It has occurred in one of the first satellites put into orbit, which was longer than it was wide, and over time started to wobble around the axis of rotation, a phenomenon called nutation. Airplanes with a long wing span can maintain a high roll rate without pitch and yaw being affected - the Starfighter was the first plane with short wings, and with a high roll rate came undesirable pitch and yaw effects. And also a challenge when turning, judging from the famous phrase of a Canadian pilot: "Banking with intent to turn." The T-tail is not really a solution to inertial coupling, only a longer wing span around the CoG is. Inertial coupling was prevented by limiting the roll rate. The T-tail did increase directional stability of the vertical tail due to the winglet effect, as did the ventral fins. So contrary to the wikipedia statement, the T-tail was not primarily implemented to reduce inertial coupling. Not the answer you're looking for? Browse other questions tagged aircraft-design aviation-history aircraft-physics or ask your own question. How many kills did Neil Armstrong have? Is the MTOW determined by the wheel maximum supported weight? Why did some Caravelles have a very long dorsal fin?